Monday's three scheduled sweeps were due to take place at 1000 (0700 GMT), 1300 and 1700. 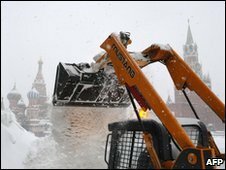 A police source told Interfax news agency that Muscovites had largely heeded calls to avoid driving and there had been no significant increase in traffic accidents. Weather forecasters were predicting that the snow would die out overnight, with Tuesday set to be a clear day.